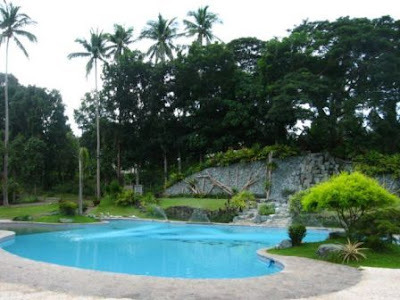 Yesterday was our office activity at Shercon Resort in Mataas na Kahoy, Lipa City in the province of Batangas. Beautiful place, although a bit secluded for my taste. You may find their website here. The views were awesome! Check the pics below. Beautiful Taal Lake behind us. A bunch of loonies posing for an imaginary CD album cover (ala "Eraserheads"). That's Aries, Ferdz, Rodel, Mark, Mar S., Christian, Luis and Alex. Waiting for some action at the pavilion with Ferdz. Yummy food! And that’s just a part of it. What a view! That’s Taal Lake in the background and those are tall mahogany trees in the foreground. The big pool. Notice the fountains at the back. This is a beautiful reception place for weddings, debuts, anniversaries, etc. The loony gang ruins the view of the pool. Finally, my time at the pool! I even misplaced my white Atlantics googles and I had to use Karen’s orange goggles. Luckily some of the guys recovered the white goggles. After the swim, we partook of the super delicious pork barbecue the rest of the gang prepared. HMMMMM. Wow! 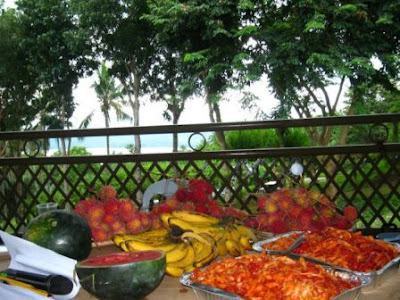 You've been to Aguila Beach Resort in Anilao and then Shercon at Lipa City. Good to know you're enjoying places here in Batangas. I've never been to Shercon before and it's been years already since I haven't visited Aguila again. 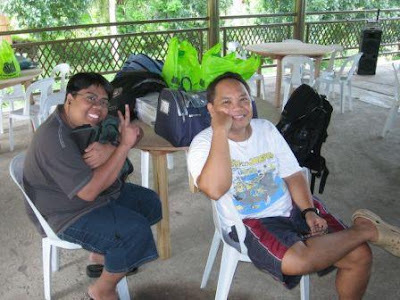 You forgot to mention Porto Laiya at Laiya Ibabaw, San Juan which we recently visited in this entry. 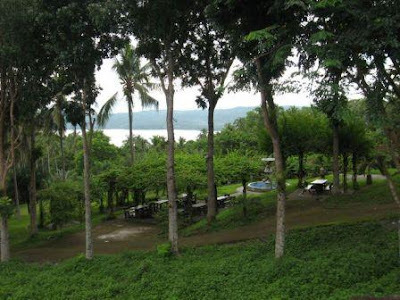 Batangas is blessed with so many beautiful beaches and lake resorts. My only qualm is the roads that lead there. If only we had better infrastructure: wider roads, alternate concrete roads and better road signs/directions, then tourism would increase many fold. Batangas definitely has so much to offer. Ah yeah, you've been there too. :) To be honest, I haven't heard Porto Laiya but I've been to Laiya Coco Grove. Laiya is a very nice place too. Years back, there were no concrete roads and street lights, add to that network signal. So it was definetely a dead end there but the experience was memorable. I so look forward to go back. That's the outcome of exploring some parts of MIMARO. I tend to appreciate the other beaches now..